Religious groups at a U.N. conference urging governments to make decisive progress toward establishing a framework for completely eliminating nuclear weapons, found that the world nuclear powers boycotted the meeting. The wide-ranging faith groups that included Buddhist, Christian, Jewish, Islamic and other religions, made their call on governemnts in a statement read on the second day of the U.N. conference to begin negotiations on a legally binding instrument to prohibit nuclear weapons. Their message was titled: "Faith Communities Concerned about Nuclear Weapons." At the same conference on March 28, Pope Francis said in a message, "The ultimate goal of the total elimination of nuclear weapons becomes both a challenge and a moral and humanitarian imperative." The message was presented by Monsignor Antoine Camilleri, secretary for relations with states. "International peace and stability cannot be based on a false sense of security, on the threat of mutual destruction or total annihilation, or on simply maintaining a balance of power," said the Pope. "It is an exercise in hope and it is my wish that it may also constitute a decisive step along the road towards a world without nuclear weapons. Although this is a significantly complex and long-term goal, it is not beyond our reach." Jasmin Nario-Galace of Pax Christi Pilipinas read a separate joint statement on behalf of Faith Communities Concerned about Nuclear Weapons before representatives of some 120 governments taking part in the negotiations. The talks took place at U.N. Headquarters in New York and continued until March 31. Nario-Galace was quoted in a statement saying, "As various faith communities working for a world without nuclear weapons, we aim to show that we share the same aspirations for peace and for a world where people live without fear." The signatories included more than 20 individuals representing diverse faith groups from Pax Christi and the World Council of Churches to Islamic organizations; Soka Gakkai International, a Buddhist association; the Quakers in Britain and Religions for Peace. The groups stressed that nuclear weapons manifest a total disregard for the shared ethical values of religious faiths. 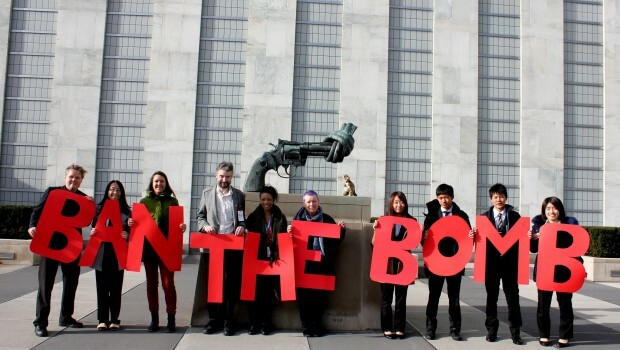 At the start of the U.N. conference to negotiate a legally binding instrument to prohibit nuclear weapons, Kim Won-soo, the U.N. High Representative for Disarmament Affairs highlighted that creating a world free of such weapons is a common obligation of all States – both nuclear and non-nuclear – and called for their inclusive engagement. "Let us all work harder and more creatively, so that we can achieve our common goal of a world, safer and more secure, without nuclear weapons, and better for all," said Kim. Nuclear weapon States justify their continued existence as a deterrence irresponsible nations or other hostile countries with these deadly weapons. Chow Chung-yan wrote in an op-ed in the Hong Kong's South China Morning Post on April 2, "Among the crazy things that took place this week, here is one that is not getting much attention: the United Nations called for a meeting ...to continue negotiations for a legally binding ban on nuclear weapons. "But nearly 40 countries – including the US, China, Russia, Britain and France – decided to skip it," wrote Chow. "None of the participants from the 100 countries attending the meeting belong to the group of States in possession of nuclear weapons." U.S. Ambassador to the United Nations Nikki Hayley said, "As a mom, as a daughter, there is nothing I want more for my family than a world with no nuclear weapons. But we have to be realistic." She spoke as she and colleagues from Britain, France and about 20 other nations, not all of them nuclear nations, gathered outside the General Assembly hall to show opposition to the talks starting inside, The Associated Press reported. Haley argued that a treaty would end up disarming nations "trying to keep peace and safety," while "bad actors" would not sign it or comply. According to 2016 estimates, more than 15,000 nuclear warheads remain in global stockpiles. The group of religious leaders condemned the theory of deterrence and the catastrophic humanitarian impact of any nuclear weapon use. "We reject the immorality of holding whole populations hostage, threatened with a cruel and miserable death," the group members said. "We applaud the world's political leaders that have demonstrated the courage to begin these negotiations." The statement also urges States not participating in the current round of the negotiations to reexamine their positions and commit to joining the June-July session in good faith. Kazuo Ishiwatari, Soka Gakkai International's peace and global issues director said, "To be successful, a treaty prohibiting nuclear weapons must heed, reflect and embody the voices of the entire human family." Yet, as Pope Francis indicated it will not be easy to negotiate an end no nuclear weapons as those who argue for the nuclear deterrent are also able to strongly articulate their arguments. The U.S. top nuclear commander on March 31 denounced the draft U.N. resolution to ban nuclear weapons. He stated that before the nuclear age the world was marred by "death and destruction" and that the advent of atomic arms dramatically reduced great-power conflict. "Can I imagine a world without nuclear weapons? Yes, I can. That's a world I didn't like," said Air Force Gen. John Hyten, head of the U.S. Strategic Command. He was speaking at the Military Reporters and Editors Association annual meeting, hosted by POLITICO and Northwestern University's Medill School of Journalism.